Ok I am the current translator of this series so my opinion might be biased but the reason I picked up this series was because of how the characters are well developed and how few incongruities it has. This light novel wasn’t on the top 10 of Kono Light Novel ga Sugoi! For the past 3 years for nothing (2014 2nd, 2015 10th, 1016 3rd), the story flows really smoothly and makes the reader entertained. Furthermore the main character is smart, not op but smart, and its not a smartness that makes... more>> the reader think everybody could think of that solution and it’s just the other characters that are dumb. 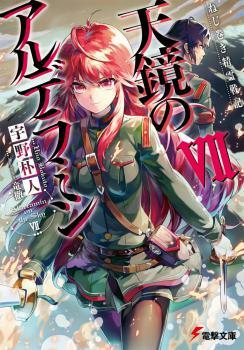 I consider myself an avid reader and this was the first time I found myself thinking ‘Hm, this is so good, it’s a shame that it not translated anymore (both translators on BT seems MIA), I should translate this so others can read it too!’. This novels will suit you if you're looking to a novel that handles things a bit more mature than the usual jp novels. All of the characters are being developed and have actual backstory. Relationships get explored, battles are fought and blood is being spilled. It is a great read if you are into well thought out characters with good pacing and development as he deals with situations in an intriguing manner that keeps your glued into the story, unlike the typical cliches that are used it makes you get that feel of 'wow' or 'interesting' as he solves his problems in a calculated manner. One of my favourite franchises if all time. If you love Madan no Ou to Vanadis, you'll love this. Deep, engaging plot. Great world building, and great intercharacter relationships. A very well written and solid novel. Exceptionally strong main characters, each with their own way of living and characterization that shines through and manages to maintain a level of uniqueness despite being somewhat tropey (or rather overdone) archetypes*1, good pacing and solid world building that focuses on setting things up for future use in the first few chapters of a novel then making use of them as necessary. The hook that is dangled at the end of Volume 1 is very compelling indeed and if each volume has a... more>> hook as powerful as that one, certainly worth reading more of it. Really are you sure???? This is a really humongous spoiler that you really don't want to read unless you're really far into the story. Gotta be sure, there's no turning back! Yatorishino Igsem dies (and in Ikta's arms too, blocking bullets for him). It was super heartbreaking that after all they've been through, the author chooses this. Well, I guess that just means the ship for the princess is sailing for sure. Or not at all. If you like story about strategy like Altina the sword princess, then you most likely like this story. In hopes of someone picking up this series for translation... I really loved to read this and basically binged it. Good interaction between characters that are likable. And good build up for the story so far. As a person reading mostly fantasy novels I highly recommend this if you like this genre. I also like the romance and military theme. I had a run in with some sh*tty novel lately so I judge this novel without concerning its contents and avoid it completely for years. But when pick this up I was astounded by the characters especially the heroin who claimed she would do anything for honor and for country even to extreme lengths. And of course our lazy MC the sloth who sought the easy way out in tackling problems with logic and finesse rather than exerting yourself. That all I can give with my poor English and review. I don't understand why this doesn't have Comedy in it's genre. This is a great story of a "lazy" but brilliant MC & his annoyingly high motivated friends. It's not that He's unwilling to work hard, he just dislikes wasting effort on unnecessary things. He's smart enough to figure out a better way to accomplish a goal. Whether he has any personal interest in those objectives has little effect on his ability to achieve them in the most efficient way possible. Efficient also includes not wasting lives, but sometimes ruthlessly sacrificing... more>> them.